Rumours of an ABS-equipped Royal Enfield have been doing rounds for quite some time with many stating that the entire range would get only single-channel ABS, barring the Royal Enfield Himalayan, the upcoming Interceptor 650 and Continental GT 650. However, all those rumours have been slammed by the heritage classic bike manufacturer. As exclusively reported by us earlier, Royal Enfield has launched its highest selling model, the Classic 350, with dual-channel ABS in India today at Rs 1.61 lakh (ex-showroom Pune). 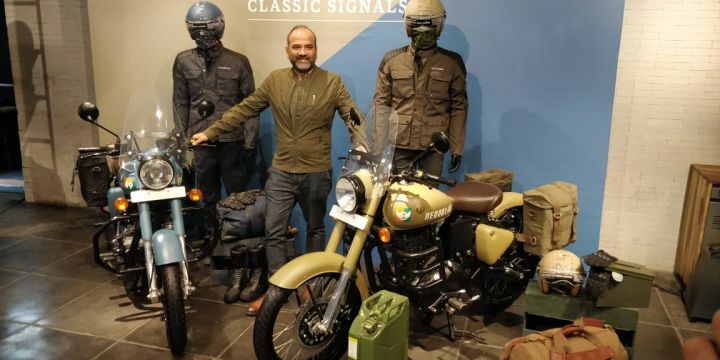 The new variant is called the Classic Signals 350 and is inspired by the Indian Army Corps of Signals, which is a division that oversees military communications. Apart from the safety net and the 240mm rear disc, the company is also offering this variant in two new colour schemes - Airborne Blue and Stormrider Sand. The instrument cluster now features a low fuel light and an ABS light instead of the ammeter that's offered on the standard Classic 350. The serial number on the fuel tank also varies from one bike to another. Apart from these changes, the Classic 350 remains unchanged mechanically. The 346cc, single-cylinder, air-cooled motor is mated to a 5-speed transmission, and pumps out 20PS of power at 5250rpm and 28Nm of peak torque at 4000rpm. Suspension duties are handled by 35mm telescopic front forks and and twin gas-charged shock absorbers at the rear. The braking setup will comprise of a 280mm disc up front, while the rear uses the same 240mm rear disc seen on the Gunmetal Grey variant. The new variant of the Classic 350 is Rs 22,000 dearer than the standard Classic 350, which is priced at Rs 1.39 lakh. Currently, the motorcycle competes against the UM Renegade Commando Classic (Rs 2.03 lakh) and the Bajaj Dominar 400 (Rs 1.62 lakh) (all prices, ex-showroom Pune). Out of the competition, only the Dominar comes with a dual-channel ABS. Bookings for this new motorcycle are open across all the 850 RE dealerships in India for a token amount of Rs 5000. Royal Enfield will also be launching the ABS-equipped version of the Himalayan and the Classic 500 next month, and by April 2019, their entire portfolio will feature ABS.